It’s pretty obvious that no Major League Baseball player would be caught dead wearing a dress to the plate. But one batter wore one, and turned the at-bat into an outrageous incident that left fans hooting and hollering. 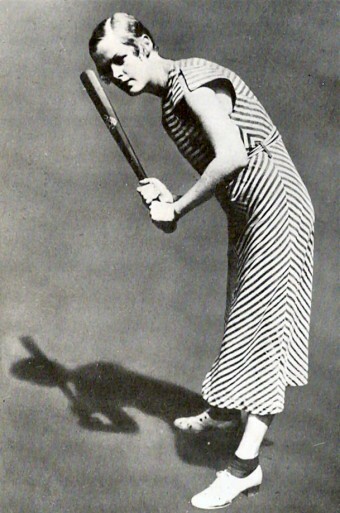 Nightclub singer Kitty Burke hit a ball thrown by St. Louis Cardinal pitcher Paul “Daffy” Dean, becoming the only woman to ever bat during an official Major League Baseball game. Her at-bat did nothing to advance MLB’s gender barrier that had recently risen up, but it did demonstrate baseball’s amazing tendency to constantly show you something you’ve never seen before, even for lifelong fans. Kitty’s infamous plate appearance occurred during a night game between the world champion Cardinals and the hometown Cincinnati Reds at Crosley Field on July 31, 1935. The game in which Kitty made her one and only appearance was played in a slightly carnival atmosphere because the first night game in history had only taken place just two months earlier at Crosley Field (on May 25, 1935). Night baseball was still a novelty. At the time, Crosley Field had a seating capacity of 26,000, but the game was oversold. As a result, more than 10,000 fans were herded like cattle onto the field to watch from a roped-off area in foul territory that stretched from behind home plate and down the foul lines to the outfield fences. Kitty, a beautiful blonde blues singer and rabid Reds rooter was among the fans on the field. She was standing only ten feet away from home plate when the Cardinals’ Joe “Ducky” Medwick stepped to the plate in the eighth inning with St. Louis ahead 2-1. Kitty disliked the brash player, especially since he had scored on his previous at-bat. In the bottom of the eighth, Kitty was still fuming mad over Medwick’s retort. So when the Reds’ Babe Herman headed toward the batter’s box, Kitty decided to take action. “Hey, babe!” she hollered, “Lend me your bat!” Herman decided to play along, so he called time and offered his bat to the lady. Wearing a dress and high heels, kitty marched up to Herman, took his bat and stepped into the batter’s box. The crowd roared with laughter. Among the spectators was baseball commissioner Kenesaw Mountain Landis, who just a few years before had banned a 17 year old girl from playing in the minor leagues after she struck out Babe Ruth and Lou Gehrig back to back (at the time she was playing for the Yankees AA club). Rather than fire a fastball, Dean lobbed the ball underhanded. Kitty swung and hit a slow dribbler back to the pitcher. He fielded her tap and ungallantly threw her out. Kitty then ran back into the cheering crowd and into baseball history. But you won’t find her name in any record book. Her appearance at the plate didn’t count, even though St. Louis manager Frank Frisch made a half-hearted argument that Cincinnati should be charged with an out. Kitty parlayed her at-bat into an act that she took on the Burlesque circuit, billing herself as the only woman to ever bat in an official Major League Game, let alone in high heels and a dress. She was also given a Cincinatti Red uniform from MacPahil which she used in her burlesque act. While Kitty was no professional baseball player, there were numerous women who’ve played the game at a level equal to their professional baseball playing male counterparts. You can read about a few of these here, including about “The Queen of Baseball” who was the first person (man or woman) to play on both the National League and American League All Star Teams. Kitty Burke is my grandma and her real name was Virginia Georgia Murphy. She was a talented blues singer and Kitty Burke was her stage name. After she married my grandpa she became a nurse. She passed away in 1964 at the age of 53 but kept all the newspaper clippings and still had her “uniform” from the day she went to bat. This is a lovely tribute to her and makes me very proud. Thank you for putting it out there. Wow – thanks for sharing that! I am a retired teacher and elementary principal.This would be such a great book for so many young girls that can be shown yet another example of what a difference a bold,courageous can make!